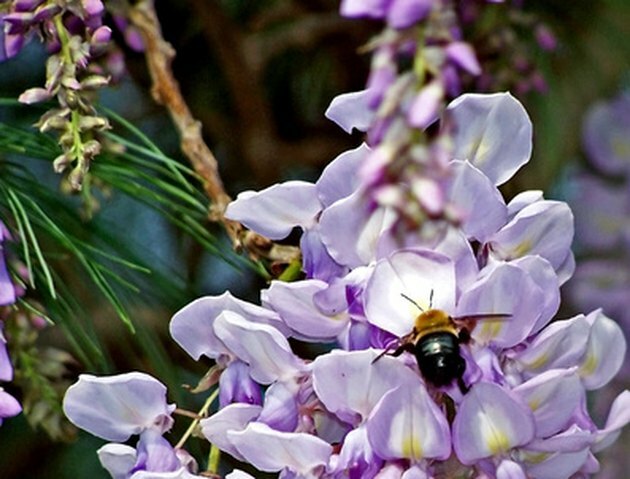 Wisteria is a long, twining vine that is used in the home landscape on trellises and fences. It is hardy, vigorous, climbs high and lasts for a long time. The large flower clusters appear in the spring. The individual flowers are similar to peas and can be purple, pink, white or bluish in color. The wisteria fruit is long and flat. The twining stems wrap around objects to climb toward the sunlight. There are two types of wisteria that are usually grown in gardens: Wisteria floribunda (Japanese wisteria) and Wisteria sinensis (Chinese wisteria). Both grow to a height of 25 feet or more. Give wisteria vine a support system such as an arbor or trellis to encourage rapid growth. Choose a planting location that is in the full sun, which means more than six hours of sunlight daily. The soil should be moderately fertile and moist. It should not dry out too much. Wisteria will grow in most soil types but prefers those with a pH of 6.0 to 7.0. Make sure there is some sort of support nearby, such as a fence. Loosen the soil in the planting area with a rototiller. It should be prepared to a depth of 18 to 24 inches and a width of 2 to 3 feet. Add compost, peat moss or manure to the site to improve drainage and aeration. The overall combination should be one-third amendment, two-thirds local soil. Dig a hole that is the same depth as the wisteria vine was planted in the nursery. Place the root mass in the hole and cover with the removed soil combination. Press the soil down to eliminate air pockets. Water the vine well until the area is soaked. Give the plant 1 inch of water per week. Grow wisteria vines on vertical surfaces such as pergolas, arbors and fences. You can also attach rows of wire, wood or tubing to a building, leaving 4 to 6 inches between the wires and the wall for the plant to use. Wire, wood and tubing are the best materials to use because they will not rust. If using wood, make sure it is pressure-treated. Train the vines to grow on the support system. Choose a strong, upright stem to be the main leader. Attach it to the trellis or arbor with a twist tie or gardening wire. You can also tuck it into the support system, not using anything to hold it in place. Prune the side shoots because this will promote more vigorous growth. Train the main leader as it grows, intertwining the vine around the support system. Fertilize young wisteria vines once a year. Give them a balanced food with an equal nitrogen-phosphorus-potassium ratio. This will promote foliage growth and blooms. Stop fertilizing once the vine fills the desired space.